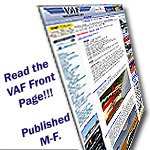 By checking the "I have read..." box below and clicking on the "Register" button, you acknowledge and agree to abide by the VAF posting rules located at: www.vansairforce.net/rules.htm. Registration to this forum is free! We do however insist that you abide by the rules. If you agree to the terms, please check the 'I agree' checkbox and press the 'Register' button below. If you would like to cancel the registration, click here to return to the forums index. Although the administrators and moderators of VAF Forums will attempt to keep all objectionable messages off this forum, it is impossible for us to review all messages. All messages express the views of the author, and neither the owners of VAF Forums, nor Jelsoft Enterprises Ltd. (developers of vBulletin) will be held responsible for the content of any message. The owners of VAF Forums reserve the right to remove, edit, move or close any thread for any reason. I have read, and agree to abide by the VAF Forums rules.